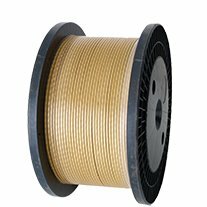 The glass in glass fibre conductor may be applied in woven tape form or as a continuous fibre. It has proven to be an efficient insulator, providing coil winders with thermal stability, and equate electrical properties and good resistance to abrasion after varnishing. The glass fibre is bonded with a varnish, to improve dielectric strength and mechanical properties. Glass fibre-lapped conductors (bare or enamelled) are very suitable for windings of electric motor stators, generators, special transformers and high voltage motors, heavy magnet coils etc. In general this insulation can be applied where high mechanical strength and high insulation properties are required. Most common application is in traction motors. It exhibits a very high degree of mechanical and thermal stability; either for class F and H insulation, when impregnated with polyester, polyester-imide or epoxy based impregnating varnishes. For higher thermal class, the glass fibre-lapped conductors can be impregnated with silicone based resins of thermal class 200. The production machinery includes high speed double six spindle fibre lapping and varnish application with inline heating oven and automatic take up reeling.